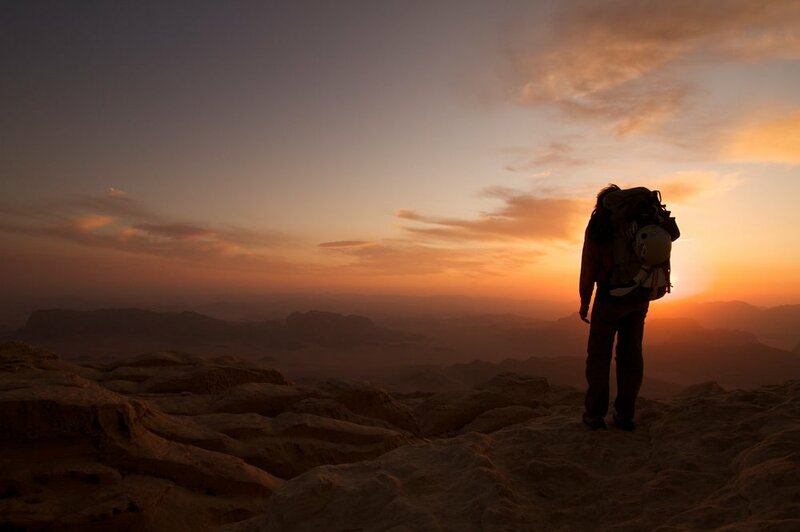 The Lawrence of Arabia desert country of Jordan has had us intrigued for some time, so we eventually made a trip there in October 2011 after having climbed and paraglided in France for a month. The impressive sandstone rock formations in the Wadi Rum reach up to 600m high, but more impressive than this is the enormous bulk of the jebels (mountains), some of which are many kilometres long and often cut right through by narrow siqs (canyons). In addition, the sandstone is in different layers, mostly an incredible orange but with the whitest sandstone on the upper of the highest peaks, and weathering of the rock has made quite rounded tops as well as created the most impressive shapes. We were initially concerned about the heat when we arrived in the Rum village and set up our tent on the dry, scorching sand. But in reality it’s not too bad as you just climb on the shady walls. The climbing is pretty adventurous multi-pitch trad climbing, but we also had some adventures through the siqs with scrambles and abseils. 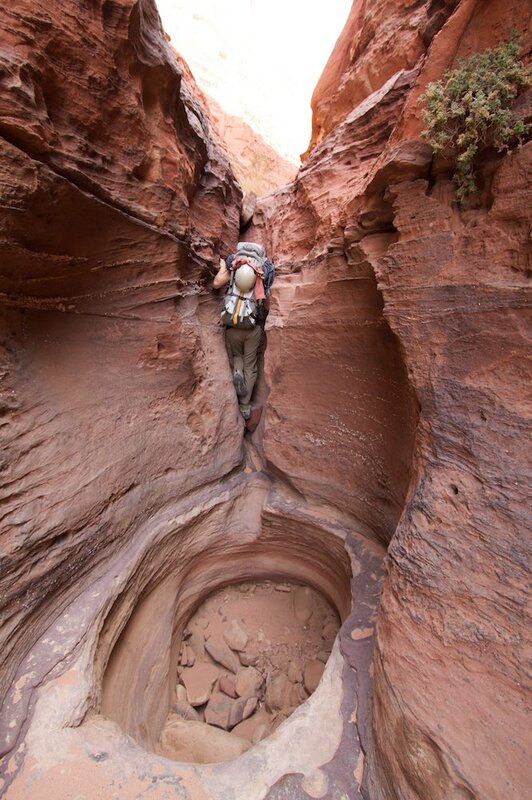 The labyrinthine nature of the rock makes it very easy to get off route or even lost! The rock quality varied from loose and sandy which was a bit unnerving to climb as you often just didn’t trust it, to fairly clean and compact, but it is very soft sandstone and there were worn footholds and deeply incised grooves from rope drag on some of the more popular routes (‘popular’ is relative here, as is certainly not a busy place). We made a foray out into the desert for a few days, being driven by a local bedouin in his 4WD vehicle, and dropped off at Barrah Canyon. 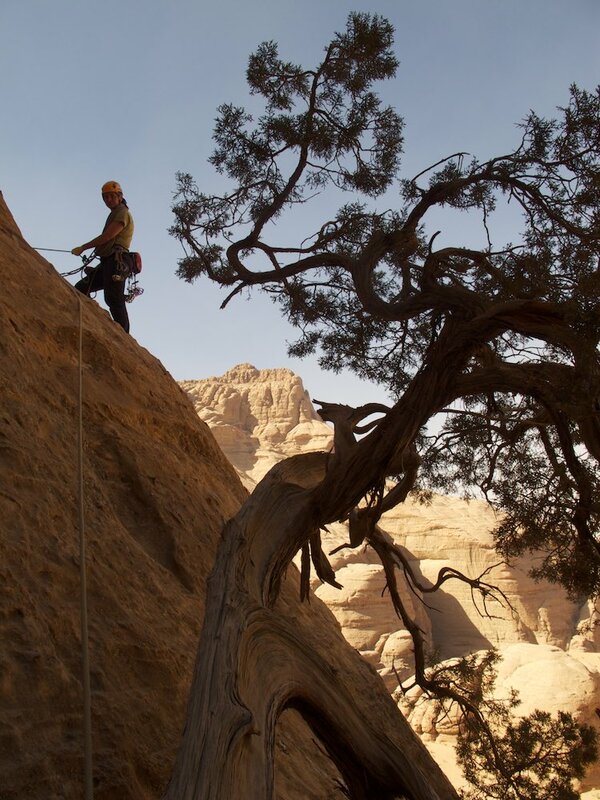 We climbed (including the classic here ‘Merlins Wand’) and hiked through the canyons, and at night we had a nice fire going and enjoyed the tranquility, apart from one encounter with a nasty scorpion! It was bliss being away from the village of Wadi Rum which is quite noisy with cars, dogs barking, music, prayers on loudspeaker at all hours and people just being loud. 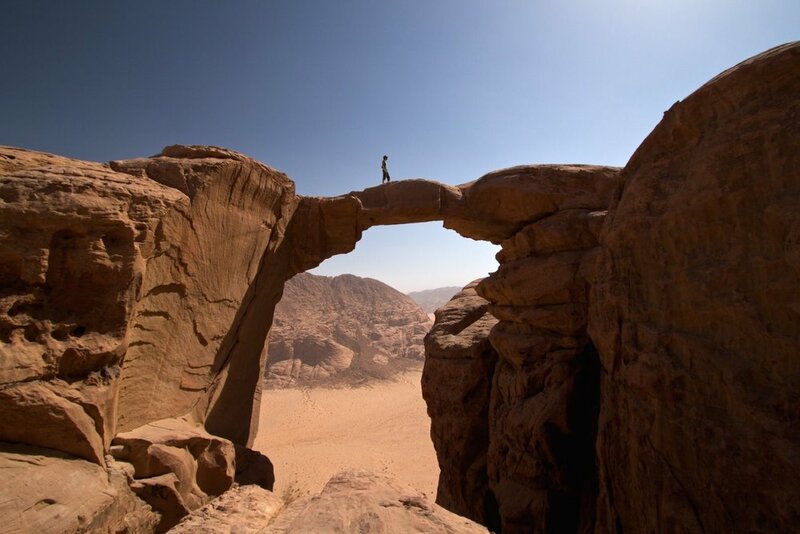 Our bedouin friend picked us up three days later and took us on to Burdah Arch, an impressive slim rock feature, where we stayed for a couple more days. Back at the village, we climbed on the nearby Jebel Rum which is huge and one of the highest around, although many of the climbs don’t go to the vey tops of the jebels. We also had a plan to climb to the very top and paraglide off as we took our full-sized paragliders with us. We climbed the easiest route since we were carrying our paragliders and other gear, with the aim of sleeping on top and flying off in the morning. As Jebel Rum is so big and the easiest route, called Sheik Hamdan's Route, was around the backside, we were driven around by 4WD. Once again, route finding was complex and although much of it was scrambling, there were some sections of French grade 3 and 4 where we needed to use our rope. We got to the summit on sunset which was incredible. 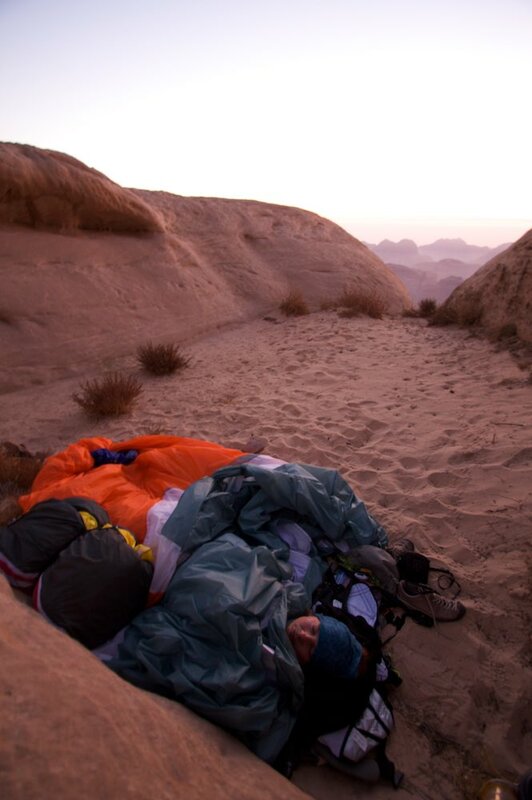 We found a flat sandy depression to sleep in, and after making a fire (there were juniper trees growing on top) we buried the hot coals under the sand and slept on top of it wrapped in a paraglider so were quite warm in the chilly desert air. It took a while for us to find a suitable launch in the morning, and all the time we were wary of it getting too late when the thermals pick up and we wouldn’t be able to launch - the descent by rappel sounded epic, if we ever found it, so was not a desirable option. Our chosen launch site was a bit small and far from ideal but the best we could find in the time we had, so our launches were a bit dodgy - big gliders were not ideal for the small launch, and mini-wings (which we only got the following year) would have been much easier and safer. However, we both got off safety and landed next to the village among some camels. This was a very memorable trip, made all the more incredible with a flight down from Jebel Rum, which we believe had only been done once before.